We love living and traveling full time in our RV. 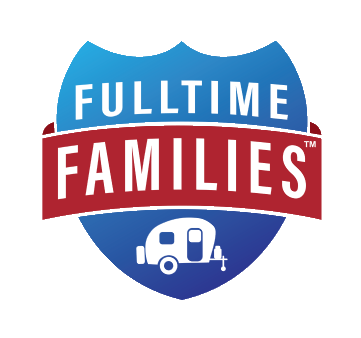 We’ve even written a whole post about how much we love full-time living in an RV. What we don’t love about traveling full time in an RV is RV departure day. Most RVers will agree that RV travel day is the most stressful thing about full time RV living. It is every RV’ers nightmare to arrive at a new exciting destination just to realize that you forgot to secure the refrigerator door. Nothing like cleaning up a huge mess to start the adventure! 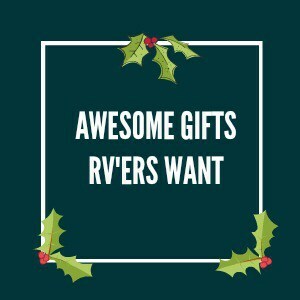 That is why we decided to put together this helpful RV Departure Checklist that will ensure your RV travel day runs smoothly!! I will never forget the day when we took off with our travel trailer hooked on the back. We must have checked and rechecked everything 10 times to make sure that everything was where it was supposed to be. We did not have a trailer checklist at the time. We still held our breath as we went down the road, hoping nothing would fall out and praying that everything that should be secured, was LOL. Most RVers agree that RV travel day is the most stressful part of RVing. There are so many things you need to remember, doors to be secured, hoses to be unhooked and tanks to be emptied. On top of all that, you need to plan snacks for the trip, figure out how to keep the kids entertained and get some rest. Yeah right. We don’t want that to happen to you so we have put together an RV Departure checklist that will save the day. 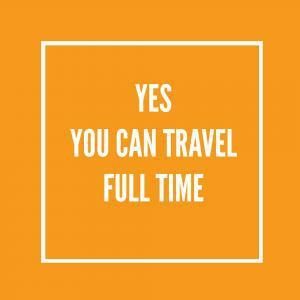 Once you know what you are supposed to do, your travel day will be much easier and the stress and arguing will end. You know what I’m talking about right? Don’t try and clean the entire RV while you put everything away (I’ve done this before and it’s a BAD idea. Make breakfast/sandwiches ahead of time so you can grab and go. Put everything away the night before so you only have to run around checking things on the actual travel day. If you have kids, let them run around and blow off some energy while you get stuff done. As much as you might want them to help and teach them stuff, I think travel day is one of those days when you let them run around while you get “stuff” done. Some Of What We Cover In Our RV Departure Checklist. On travel day there is a lot of moving and shaking going on, so anything that moves “will move”, so please be careful to secure everything in its proper place while you are in motion. 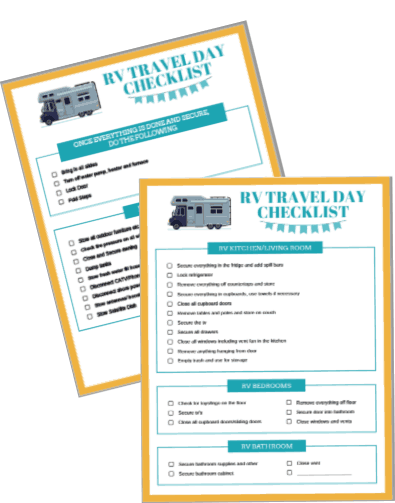 Our checklist takes you through the RV- room by room to make sure you have everything covered- and it is free to download. Our little gift to you to help you get started! Is your shower door secure? Turn off the water pump, heater and furnace. As you can see there is a lot to be done on your RV travel day, which is why we recommend getting our RV Departure Checklist. This checklist can help to put your mind at rest. It ensures you do a thorough walk thru and that nothing is left undone. RV travel day is stressful enough, we want to alleviate that stress and our checklist does that. All you need to do is print it off, put a checkmark next to each line, rinse and repeat until your checklist is completed. Once the RV is hitched up and ready to go, we get the “tired” kids and dog into the truck and we are ready to go. We have a couple more things to check before our take off. We test the truck indicators to make sure they are working, Frank pulls forward and I’ll check the campsite to make sure we didn’t forget anything and then we are off. While I am checking stuff outside, Frank is putting our travel map in the GPS and we are ready for our next adventure. Save yourself the time and stress and download our RV Departure Checklist NOW! What’s the worst thing that’s happened to you on RV DEPARTURE DAY?